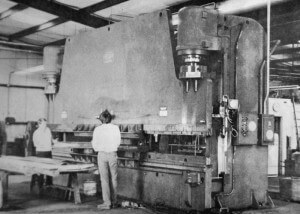 In 1947, S & H Manufacturing was founded by S.H. Sundeen and was owned and operated by the Sundeen family. Sons Sigurd (Mike) and Hjalmar Sundeen later served as the president and the vice president of plant operations respectively. Chrystel Smith joined S & H Manufacturing and maintained the values of the company. Several of Smith’s family members joined S & H Manufacturing over the years to ensure that the business’ legacy would continue. In 2014, Smith bought the company from the original family and she continues to serve as the company president today. It is this good-natured culture that makes S & H Manufacturing easy to work with and customer-service oriented. The physical plant itself is located at the original site and has 30,000 square feet of operating space with additional space to grow. The facility offers an impressive array of machinery with flexible production capabilities for a diverse range of fabricated products. With an emphasis on quality, S & H manufactures an impressive line of products to meet customer requirements. Quality, versatility and superb customer service are the factors that set S & H apart from the competition. We encourage you to learn more about our services and the broad array of products that we produce. If we can help you with fabrication of steel, alloy or other custom products, please contact us.